I ran into an unfortunate situation earlier this week. I was out on a mountain bike trail, alone — just me and my hardtail. I'm pedaling, when I suddenly hear a CRUNCH and my bike stops. The hanger has broken, and the derailleur is totally bent. I couldn't pedal, because the derailleur would travel with the chain and get stuck in the gears, and I had no way of reattaching it. Luckily, I happened to be pretty close to the town when this happened, so I ended up walking it for ~15 minutes and dropping it off at my local bike shop. However, I'm wondering what I can do if this happens again and I'm at a less convenient location - say deep in the woods. I don't generally carry any tools besides for a Swiss Army knife and an Allen wrench set. Is there anything I can do to patch it up enough to at least get back home if I happen to break my derailleur? If you carry a multi-tool which happens to include a chain tool, you could also convert your bike to a single speed. If you do so, you would have to replace the chain afterwards as well (since you shorten it) but in some situations it could get you out of a rural area. If you do so, carefully select the gear you would put it in, as you won't be able to shift anymore afterwards. There is a nice video online illustrating the idea: how to do a roadside fix of a broken rear derailleur. GCN has some more videos online explaining roadside repairs of various issues, which may also interest you. Additionally, I always take a missing link with me, as it allows you to get home after a broken chain. This speed link can also be used while converting your bike to a single speed. The bike is functional but the drive train cannot transmit power. So one solution is to scooter along with one foot on the opposite pedal, and your other foot pushing directly on the ground. This can be uncomfortable, so rotating your saddle ~30 degrees to the opposite side from where you're standing can give your hip something to lean on. You can still use your brakes to slow and stop,and steering is just like normal. This suggestion is pretty useless if there are any uphills, or any challenging terrain to cross. 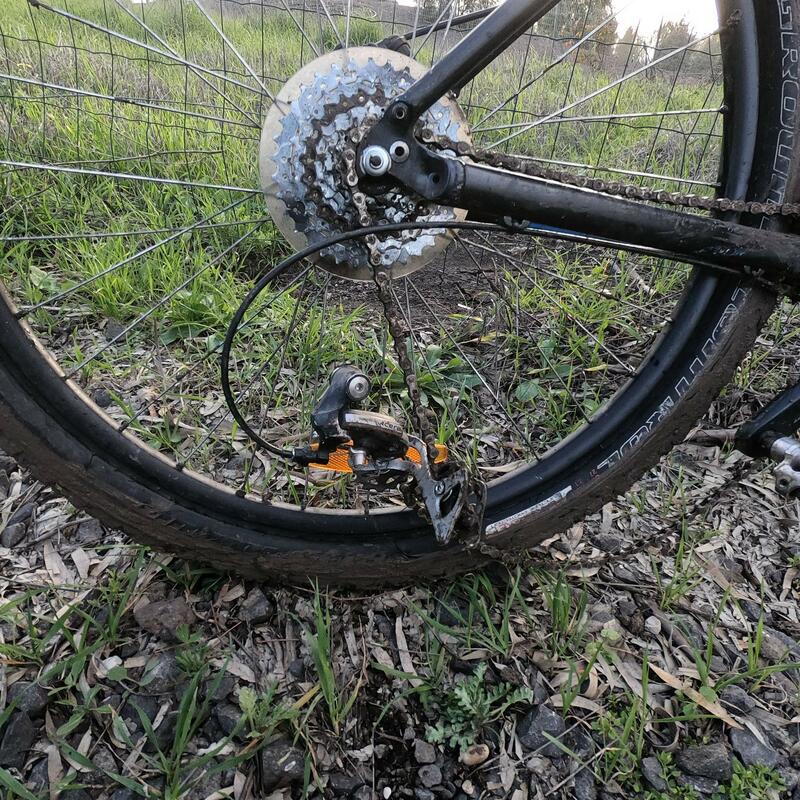 If the chain is slapping around, you can tie it to the chainstay with cableties/slipties, or if your equipment loadout is missing these then long grass or flax or even soft twigs can help retain things. If your chain has a master link, then dropping the derailleur and chain completely off the bike and into a plastic bag can help too. If you are riding with someone else then see if they are prepared to tow you out. All the above applies, but you'll be moving faster so secure any loose bits. The towstrap needs to be long enough that the tow-bike's back wheel clears the towed bike's front wheel. Half-wheeling can bring you both down if it all goes poorly. A spare innertube or two makes an adequate towstrap. A suitable branch might work but will require some creative mounting to the tow-bike. Fasten the towstrap to the front bike, and the disabled bike is NOT secured - instead the back rider holds the towstrap in their secondary hand and steers/brakes wiht their primary hand. Communication is critical, and not going too fast. If anything goes wrong, the towed rider simply drops the strap and steers/brakes with two hands. There is no need to tow on a downhill. Do take the easiest line everywhere - remember the tow-bike rider is doing a lot more work than normal, so you will owe them. Aside - those loose bits can help with repair later on, so don't litter/lose them. If not refitted in the repair, then they can help identify the right replacement hanger to buy. I hope that your derailleur hanger was a separate part and not integral to the frame. If you do have a separate derailleur hanger you can carry a spare. If the hanger gets broken install the spare. You will need more tools than a few hex wrenches to do that, maybe pliers to hold the broken hanger while you unscrew the derailleur bolt. Of course if you break the hanger you may break the derailleur as well. Carry a chain tool and spare joining pin or quick link. If the hanger or derailleur breaks: remove it, shorten the chain and make a singlespeed with the chain on a chainring and sprocket you can pedal out on. This is a last resort and is a dirty bodge. Not recommended. Use your multitool to undo the lower jockey wheel from the rear derailleur. Mind out for small parts - keep them. This would let the chain come free. You may choose to undo the inner cable from the derailleur and pocket it, or tie the derailleur up high on the seatstay out of the way. At this point you have a massively long chain. Pressing a pedal will tension the top, and the lower loop will dangle, probably dragging on the ground. You can then set the chain on the middle or big chainring and gently ride. At the rear the chain will probably migrate toward the smaller cogs. Every time you lean the bike, the dragging chain will want to step to a smaller cog/higher gear, so you have to keep the bike as vertical as possible. You might ride over your own chain with the rear wheel. You will damage your chain, possibly ruining it. The chain will try and step off the smallest cog to the right, and could wedge between the frame and cassette. There's an enormous risk of the chain catching something on the ground. This could stop you suddenly and promote the situation from a mere mechanical to a full-on injury situation. Upside: You're rolling, not walking. Not the answer you're looking for? Browse other questions tagged mountain-bike derailleur derailleur-rear damage hardtail or ask your own question. I have a schwinn ranger 24" with a tourneyTX derailleur, what options/alternatives do I have to change the rear derailleur? Stupid question: does my rear derailleur have a hanger?